With working lives that are busier than ever, and communication devices that keep us “switched on” at all hours of the day and night, it’s getting harder than ever to escape workplace stress. In fact, according to the most recent Labour Force Survey (LFS) conducted by the UK’s Health and Safety Executive, there were 11.2 million working days lost in 2013/14 due to stress, depression or anxiety. 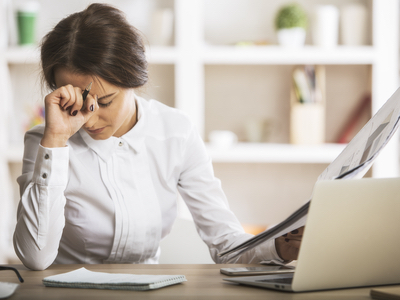 Apart from the financial impact of these lost days on businesses, workplace stress can also have a decidedly negative effect for sufferers. From a reduction in job satisfaction and morale, to physical and mental health issues, workers can face many potential problems from dealing with too much stress on the job. If you’re struggling to cope with the demands of your role, consider if it’s time to hire an employment law specialist to help you work out your next move to obtain more support from your employer. In the meantime though, there are other tactics you can try to get your stress levels under control quickly at work. Read on for some top tips to coping with workplace stress. Stress happens in the workplace when there is a gap between what you’re required to deliver, and what you feel is possible. Much of the time, managers simply don’t realise that expectations are too high, or just how many different projects you have on your plate at once. The best way to deal with work-related stress is to talk to your boss about it. Employers have a duty of care, after all, to their staff, and should be able to make adjustments or changes to your workload to improve the situation for you. It’s important not to be ashamed to ask for help as the majority of managers will understand your predicament, and would rather you come to them sooner, when things can be fixed, than to have you quit your job unexpectedly. It’s common for managers to miss the signs of employee burnout or high stress simply because they’re focused on their own workloads. However, if you bring the issue to their attention, then they can do something about it. You might need to have the ability to work from home some days, change to part-time hours for a period of time, or have your position restructured. No matter what, the key is to set up a time to meet with your boss and/or someone from the HR department to speak about setting more realistic deadlines and workloads. Look at ideas such as delegating some of your tasks to other personnel; being given longer to complete projects; and agreeing on new objectives and standards for your role. From there, schedule regular meetings with your manager and your colleagues to keep everyone updated on your progress, and to alert them to any unexpected setbacks on projects. If you find that your employer is not sympathetic to your problem and won’t budge on workload or deadlines, consider moving on to a new company where you won’t constantly be under such stress. For many people, workplace stress adds up due to the constant office interruptions that occur during the day. Apart from colleagues “dropping by” to talk about projects, ask advice, or simply have a bit of a gossip, there are also the emails, phone calls, instant messages, and meetings that workers are bombarded with on a daily basis. This all adds up to too many hours not spent getting jobs done. To combat this problem, look at ways that you can reduce or eliminate interruptions. For example, you might set up specific times each day when you answer emails and return phone calls, or let co-workers know that you are only available to talk if your office door is open or if you have a certain sign set up on your desk. Additionally, question whether you really do need to attend all the meetings that pop up. You might also want to look at potentially changing your work hours so that you’re in the office early in the morning or later in the day when things are quiet and you’ll be free from distractions. Another top way to combat stress is to eat a balanced, nutritious diet, and to make sure you get enough sleep each night (as a general rule, most people will need at least seven or eight hours). Sufficient sleep helps the body to recover and rejuvenate, and keeps the immune system functioning well — all of which plays a large part in keeping stress levels at a healthy baseline. Similarly, it’s very important to make sure you are getting enough nutrients for your mind and body to function properly. Keep in mind that eating badly or skipping meals stresses the system and can also affect your mood negatively.